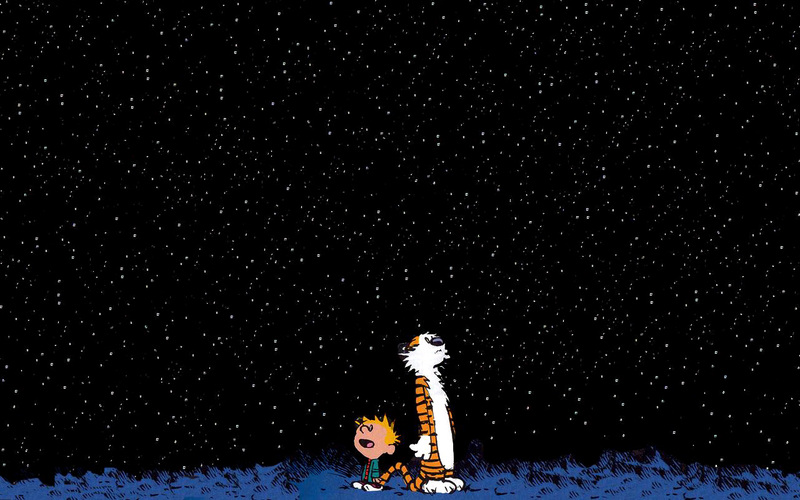 Two of my favorite comic characters contemplating the vastness of the Universe. Forever thanks to Mr. Watterson. This is a blog post I wrote in March of 2008—a year before there was even Lights in the Dark! I’m sharing it again because it’s fun…I hope you think so too. We’ve all seen the grade-school models of the solar system. Maybe you made one in science class. Out of painted styrofoam balls or colored construction paper. Maybe you saw one of those giant models hanging from the ceiling of your local science museum. Big colorful globes, some with rings around them, some painted swirly colors, others looking more like pitted rocks. For most people, that’s their impression of the solar system. Yellow sun in the middle, then all the different colored balls swooping around it. Some people even remember all the names from third-grade science class. Maybe even in order. (My Very Eager Mother Just Served Us Nine Pies?) If so, scratch-n-sniff stickers all around. Yum, root beer! One thing that these models and illustrations we have become used to seeing can’t show us is the scale involved. We’ve all heard of “space,” it’s the place “up there.” It’s where the guys with the right stuff get to go and eat rehydrated meatloaf from a Capri-Sun bag. It’s where our TV satellites are, and where the Star Trekkies drive around at warp speed, visiting strange new worlds like one might visit stores at the mall. But how much space is in space? That’s an easy question to answer – a lot – but a very hard one to really understand. We’re just not made to comprehend sizes and distances like that. We don’t have to. We live here, on Earth, and always have. It’s a finite place, and even then we have a hard time comprehending the size of it all. We know about these other places, beyond our planet, as any grade-schooler does, and we hear the numbers representing the miles between: 240,000 miles (to the Moon), 34 million miles (to Mars), 93 million miles (to the sun), etc etc. Big numbers. But just…numbers. Regular people don’t work in those numbers. We might know it’s 5 miles to work, we get 28 miles to a gallon of gas (highway) and Aunt Louise lives in Boca Raton, about 900 miles away. Maybe we can even convert to kilometers. But 34 million miles? Okay, great. That’s far. Right? Yeah, it sure is. And you know what’s there to do in between? No Applebee’s, no rest stops, no trees, no rocks, no air, no nothin’. Just space. Lots and lots and lots and lots and lots of space. No kidding right? I mean, that’s why it’s called space. Duh. Well yeah duh, but still it’s really difficult to picture. It’s real and it’s there, right now, but it’s hard to picture. Hard to imagine with our monkey brains and grade-school models. It’s hard to do in print and unwieldy as a model, but as a web page it can be done. That smart fellow made a scrollable web page that accurately shows the sheer distance between the planets, in relative scale size too. [UPDATE: here’s another.] Consider that the sun makes up 98% of all the matter in our solar system, and you see why it’s so big on the first page. Even fat old Jupiter is inside that remaining 2% of matter (and a good portion thereof). At the bottom of the page, there should be a scroll bar. Use the right arrow to start your trip on a horizontal track across the span of space separating the planets. If you try to drag the bar yourself you’ll be going too quick…use the arrow. Just start scrolling. If you have a minute or two you can scroll to Saturn, Uranus, Neptune and finally little old demoted [but maybe soon re-moted?] Pluto. And the page stops there. It doesn’t keep going out to all the other rocky little worlds they keep discovering and giving boring string-of-numbers names to, and the swarms of ice balls that sometimes become comets all still held in the sun’s gravity. Even way out there where the sun looks like nothing more than an obnoxiously bright star in the sky and sheds slightly more heat than the pad of sticky notes on your desk does, it has the gravitational upper hand. And that’s just our solar system. Our family. Our painted styrofoam balls. There’s a lot more out there, even farther away. Some of the stars you see at night may have their own. Many do, we’re finding. With their own planets, their own Jupiters and Uranuses (giggle) and maybe even their own Earths, named differently of course with their own little models of their solar systems and perhaps even a few monkey brains trying to figure out what it all means. As I’ve mentioned previously, I learned the mnemonic, “Mary’s velvety eyes make John stay up nights period (. )” Yours makes more sense- and would be GREAT for Pi Day! I have never heard that one…or maybe I forgot it in favor of food!